In case you were checkin' out the inside of your eyelids, or perhaps living under a rock, within the last 12 hours, we just might have landed on Mars. No, really. Mars. It's pretty damn amazing what mankind can do when they use their imagination. I can't even imagine being in that control room, just watching it I was grinning from ear to ear, and not just because of Mr. Mohawk! This leads me to another point. Mr. Mohawk, otherwise known as Bobak Ferdowsi, the Flight Director on the Mars Science Laboratory Curiosity mission, has become an internet sensation and the object of many womens' dirty thoughts literally overnight. Because of a handsome face, a daring hairstyle, and a larger-than-average brain, the internet is abuzz with this Pasadena, California-based space stud. 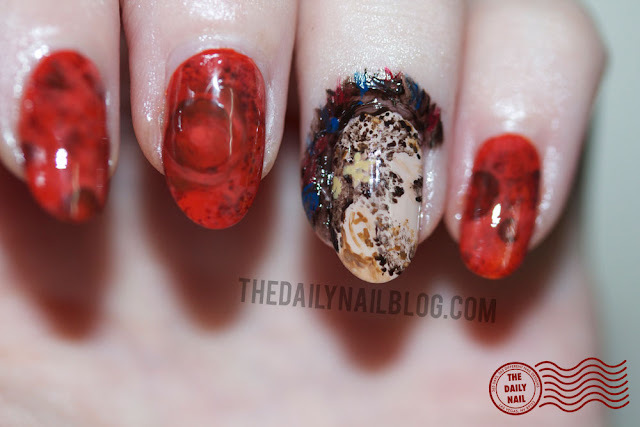 Well, you know me, nerdy nails are definitely my forte, so how could I resist a nail art tribute to the events (and people) that filled today with excitement? 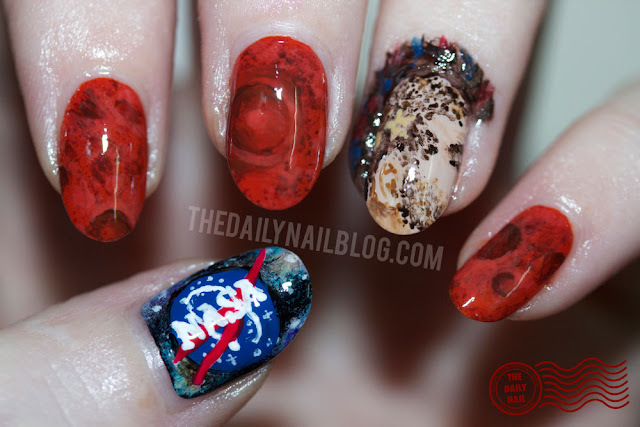 So what did YOU think about the Curiosity Mars landing? How about Mr. Mohawk? My hubby and I were watching, we noticed Mr. Mohawk, but we also noted how different the crowd in that room was from back in the Apollo missions days. It was cool to see women, mohawked men, men with multiple ear piercings, people from all national cultures, and just the diversity in that room. It was the coolest part of the whole thing! Oh my god this is awesome! Love the mohawk. Sadly enough I was indeed checking the insides of my eyelids last night..
Nails aside, that guy is hot. I had no idea about him or his rover. This is so awesome!! How long did this take you? MARS!!!! Is that not just SO freakin' kool? ...and Mister Bobak Ferdowski ain't so bad either. The thing I find so very fetching about him is that he is not merely intelligent, but he really seems to "get it". The universe, teamwork, hairdos- he gets it. That is ultra swell in my book. 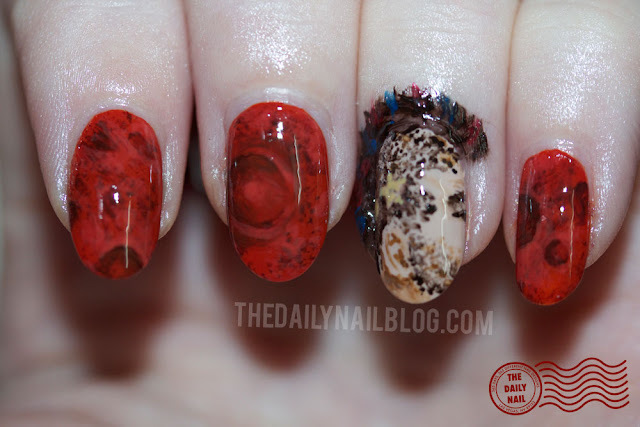 And I LOVE the Mars excursion mani! 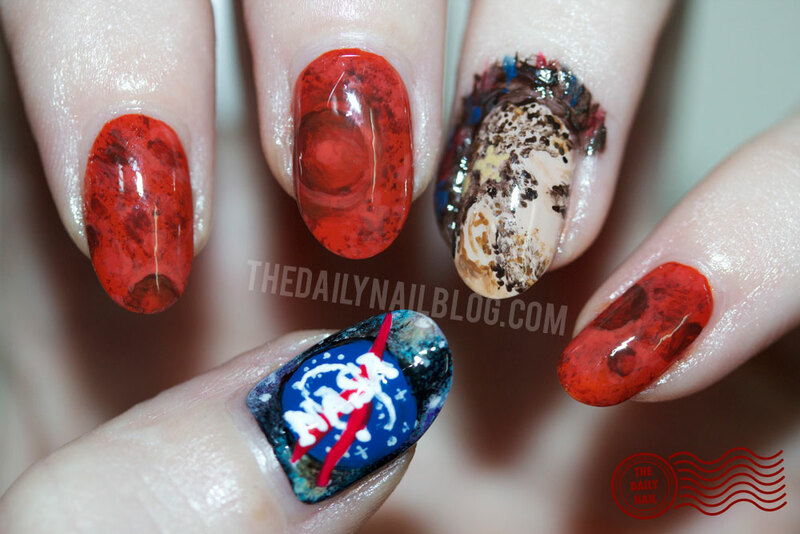 Big fan of the red planet nails! So COOL! What a fabulous idea! I love it!! That is just amazing - well done!